1. Pressure cook moong dal with chopped tomato, turmeric, and one red chilli for 3 whistles. 2. In a pan, heat Ghee and add the ingredients under “to season” in an order. Fry garlic until light brown. Now, add the seasoning to the cooked dal along with little salt. If you want, you can add 1 tablespoon of cream. Now, Dal Tadka is ready! This entry was posted in Dal-Based and tagged Dal Recipes, Dal Tadka, Recipe Category, Turmeric Powder on November 22, 2014 by vikashbhardwaz. A Very Simple and Healthy Thuvaiyal! 1. Heat Ghee or oil in a pan. Put asafoetida, followed by Toor Dal and red chillies. Fry until Toor Dal becomes golden brown. Cool it down. 2. Now, grind the dal mixture along with coconut, garlic, and salt without adding water for the first grind. Then, add 1/4 glass of water and grind it to a coarse paste. Now, Paruppu Thuvaiyal is ready! Serve. Rasam and rice with a dash of Ghee. Do not add Ghee or oil more than required to increase the flavor. It would be difficult to grind. This entry was posted in Dal-Based and tagged Heat Ghee, Paruppu Thuvaiyal, Toor Dal on November 22, 2014 by vikashbhardwaz. I make dal everyday at home because Sanvi and Shreeya love them. Either one of them will have it everyday. Most of the times, I will have some dal as leftover. With the leftover dal, I will make sambar most of the time or some dal-based recipes. This time, I had to drop Sanvi in school and also make lunch for Shreeya. I was tired of making sambar for lunch. When I was thinking of some easy recipe, I found this Sindhi style Dal recipe. I found it to be very simple and easy. I also make dal in a similar way. Only difference being I add chopped tomatoes in my dal whereas in Sindhi style dal, we add tomato puree. If you ask me if there could be any difference between adding chopped tomatoes and tomato puree, defintely there is a good difference. Try it out and you’ll like it. Believe me, it is a very easy and simple dish that goes well with Pulkhas, Chappathi and Rice. 1. 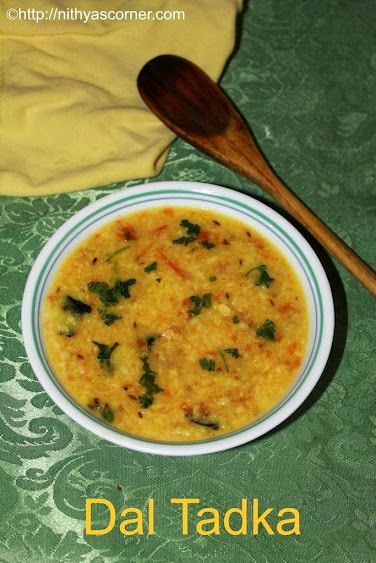 Wash moong dal thoroughly and soak it in water for 20 to 30 minutes. Add chopped tomatoes to a blender and grind it smoothly. 2. Boil moong dal using 3 cups of water. Once moong dal becomes soft, add chopped green chillies. Then add turmeric powder, finely chopped ginger, and salt. 3. Stir well and cook the dal until it becomes mushy. Then add the tomato puree. Stir well and then add coriander leaves. 4. Cook for 10 more minutes until the tomato puree and the dal are cooked well. Now heat a teaspoon of oil in a small pan and then add cumin seeds. Once the cumin seeds turn light brown, add asafetida and curry leaves. Now pour the seasoning to the dal. Stir well and add the coriander leaves. Now, Sindhi Dal is ready! Serve it with rice, Phulka, and Chappathi. If you wish, you could also add few garlic cloves. At the end, you could also add a tablespoon of ghee to enhance the flavor. This entry was posted in Dal-Based and tagged chopped tomatoes, Curry Leaves, Sindhi Dal, tomato puree on November 22, 2014 by vikashbhardwaz. 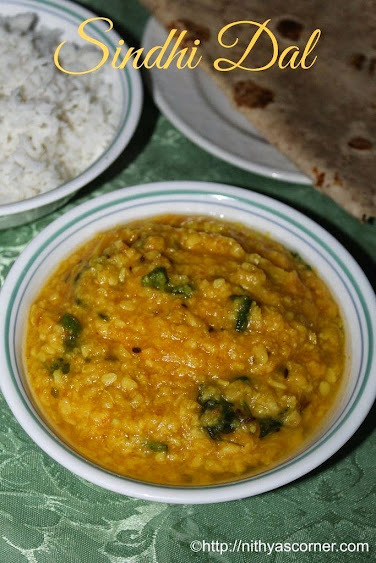 Spinach Moong Dal is one of the favorite dishes of Sanvi. I used to feed this dal right from when she was 1 year old. I add few drops of ghee in it. When she eats it well, I’ll have an ultimate satisfaction that Sanvi has eaten a healthy food. 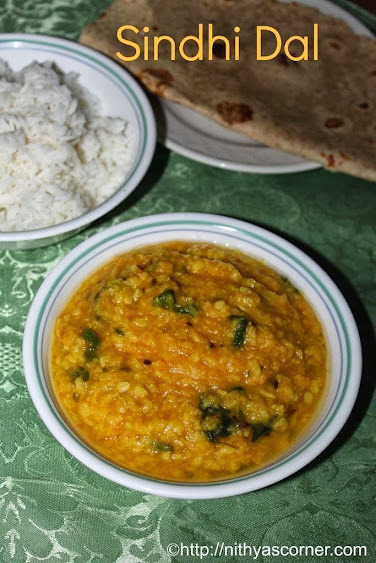 The dal is also very easy to make. The ghee enhances the flavor. It goes along well with rice and Chappathi. 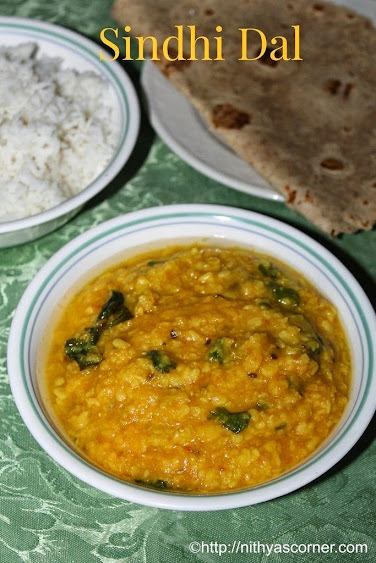 I make spinach recipes often, and this dal is also a favorite recipe of my family. I learned it from my Bangalore friend who loves this dal so much. She taught me this recipe when I asked her some ideas for Sanvi’s lunch. 1. In a pressure cooker, cook Yellow moong dal (pasiparuppu) using 3 cups of water. 2. In a pan, heat Ghee and add chopped spinach. Fry for two minutes and then switch off the stove. Let it cool down. 3. Grind the spinach in a blender/mixie by adding little water to form a paste. In the same pan, add Ghee and chopped ginger and minced garlic. 4. Then, add the cooked Yellow moong dal (pasiparuppu) and little water. Now add spinach paste, asafoetida (perungayam), turmeric powder, chilli powder, salt and fresh cream (optional). Cook for five minutes. Now, Spinach Moong Dal is ready! 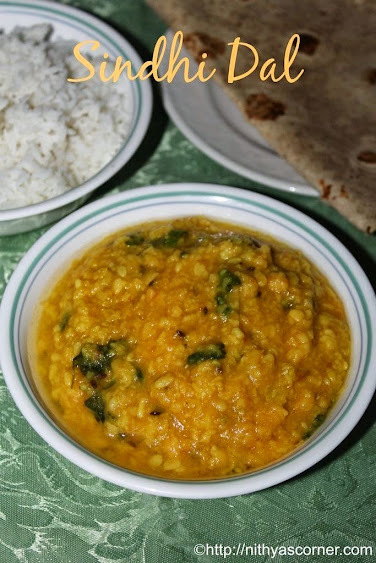 This entry was posted in Dal-Based and tagged Moong Dal, spinach recipes, Turmeric Powder, Yellow moong on November 22, 2014 by vikashbhardwaz. A very easy and simple dal to make. Spring Onion Moong Kootu goes well with Chappathi and rice. Tomatoes (chopped) – 1 no. 1. In a pressure cooker, cook Yellow moong dal (pasiparuppu) using 3 cups of water until 3 whistles. You can also boil the moong dal in an open container for 20 minutes. 2. Meantime, heat oil or Ghee in a frying pan. Add mustard seeds and when it starts to splutter, add urad dal, channa dal and cumin seeds. Add red chillies and chopped spring onions. Fry for 3 to 4 minutes. Now add chopped tomatoes and fry until tomatoes become soft. 3. Then add a pinch of turmeric powder and fry for a minute. Add the boiled and mashed moong dal. Stir well and add desired quantity of water (say a glass of water). Mix well. 4. Add curry leaves and then boil for 3 to 4 minutes. Stir well and serve. 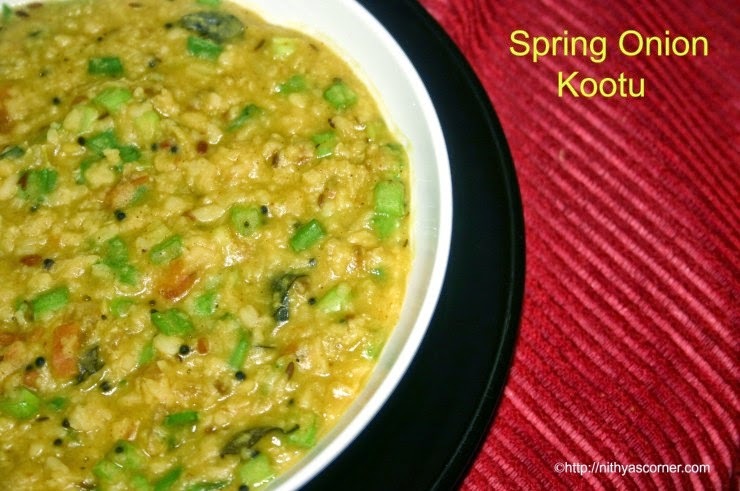 Now Spring Onion Kootu is ready! This entry was posted in Dal-Based and tagged cumin seeds, Spring Onion, Turmeric Powder on November 22, 2014 by vikashbhardwaz.